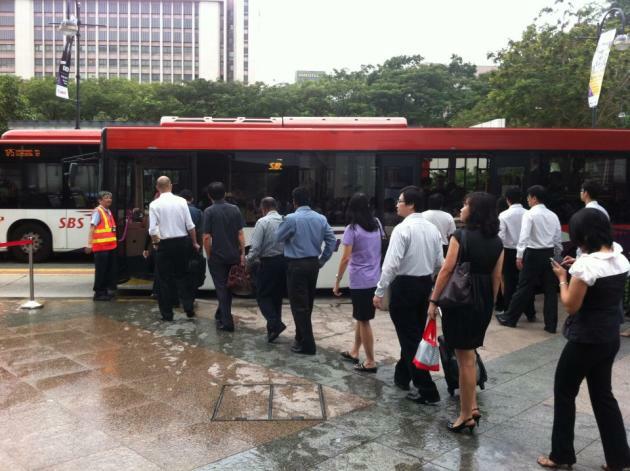 Normal train service on the North East Line (NEL) resumed at about 4:35pm, said its operator SBS Transit. After delaying resumption of its operations a second time following the discovery of a new problem relating to electricity insulation was found, its spokesperson confirmed that all stations on the NEL are now fully operational, although engineers will continue to monitor the situation closely. The delay, which had been ongoing since 5am on Thursday, was extended after engineers detected new problems in final checks after fixing snapped power cables, the root cause of the original disruption. "Our engineers have gotten the two connecting cables back up and had started testing the system for service resumption. As they were doing their final checks, they found a new problem relating to electricity insulation. This problem had not been present before and we are now working to get it resolved," it said. SBS Transit said it is "extremely sorry" to all commuters for the second delay but it had to ensure the system is operationally sound before giving the go-ahead for service resumption. Earlier on Thursday morning, about 58,000 commuters were affected up to 2pm during the peak hour train breakdown between Dhoby Ghaut and HarbourFront MRT stations. Operator of the NEL, SBS Transit, said it discovered at about 5am that overhead power cables at the tunnel of the Outram Park station had snapped. 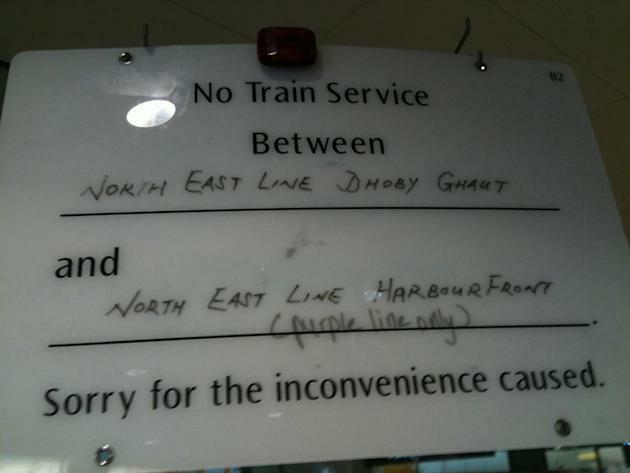 In an earlier statement, the operator said normal service was expected to resume at noon, before pushing it back to 2pm. Earlier this morning when Yahoo! Singapore arrived outside Dhoby Ghaut MRT station at 930am, at least four queues could be seen stretching in several directions, all waiting for bus bridging services. Each queue had at least 50 people but these queues gradually shortened as the morning progressed. Shuttle buses could be seen arriving at regular 5-10 minute intervals. Transport Minister Lui Tuck Yew, who was at the Dhoby Ghaut MRT station, promised a "complete check would be done along the entire stretch of the North East line at the end of service today". On how future breakdowns can be prevented, Minister Lui said he would to sit down with SBS Transit to find the root cause of the engineering problem because "it is not the same problems that SMRT faced in December". The other issue, he said, would be how to channel the flow of commuter traffic during train breakdowns. He said that while things seemed "more orderly" than the commuter chaos faced during last December's MRT breakdown, more could be done to channel people to the right places to take bridging services or even to take advantage of the normal bus services, which were also free. Tim Zhao, 35, who runs a tour agency in Chinatown, said, "The North East Line usually makes my journey more convenient. We were supposed to open at 9am so we're already late. I've alerted my staff about the disrutpion and I'm waiting from them to come so we can take the shuttle bus together." Insurance specialist Matin Lim, 33, who works in VivoCity and takes the train from Serangoon every morning, was also waiting in the queue. He said, "I only heard about the breakdown at my train station, so no time to make alternative plans. The buses are coming very frequently and there are enough staff to give directions, but it is still very troublesome. I had to push back three morning meetings with my clients because I don't know what time I will get in." Chiam Mooi Jee, 52, an audit manager who works in Tanjong Pagar and takes the MRT from her home in Kovan said, "I left my house 30 mins earlier because I don't know if the buses will be on time." 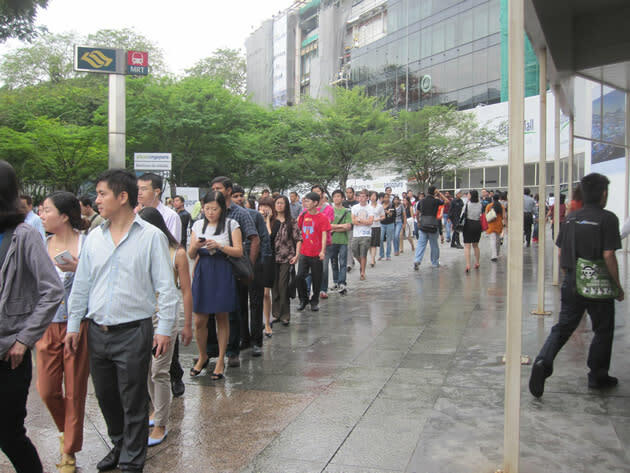 On seeing the long queue outside Dhoby Ghaut, she said: "I feel like taking a cab after seeing so many people. But who's gonna pay me the cab fare? It's quite messy because people were boarding from both doors. I already told my colleagues I'll be late. My boss doesn't like us to be late, but no choice." Over at the HarbourFront MRT, things were quieter with only pockets of people coming to take the free shuttle buses. Some tourists Yahoo! Singapore spoke to wanted to go to Dhoby Ghaut were unaware of the breakdown but said it's "common back in London". Christine Lee also wrote on Yahoo! Singapore's Facebook wall that the regular MRT disruptions are happening too often. "This breakdown thing has become so common that each time we take the MRT to work we have this subconscious fear inside us. Unlike last time people can still sleep on when there's an announcement made, now we open our eyes almost immediately whenever the sound of the driver comes on," she wrote.